With claims of more Champagne flowing in Alderley Edge, more Aston Martin's bought from Stratstone's of Wilmslow and more Millionaires per square mile in Prestbury, than anywhere else in the country, what more is needed to illustrate the levels of opulence that can be witnessed here on every street corner. It was no coincidence that the Beckham's chose to live in this area and that MTV had a TV Series 'Living on the Edge,' showing the privileged offspring who try and convince the rest of us that they are just normal teenagers with genuine feelings and growing-up pains. 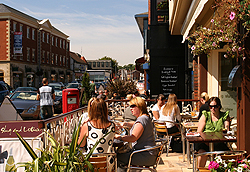 Hopefully, Whatsin-Wilmslow can help the remainder of us discover and enjoy the true rewards of living in such a privilged area of the country. Stay Restaurant and Bar, Alderley Edge has recently opened in the previous premises of El Vina. Stay is the brainchild of Heddy who has successfully run Heddy's Mediterranean Restaurant and Bar in Water Lane, Wilmslow, for over the last decade. Heddy's is noted for being included in the Good Food Guide 2008.
the Boardroom - Cheshire's first independent Flexi-bar. Renowned for being Wilmslow's party venue, night-time entertainment in the form of live music and Djs. Free WIFI and live Sky sports. Located just 3 minutes from Wilmslow train station, or a 10 minute drive to the motorway network and to Manchester Airport. Shopping - Designer Shops, Department Stores, Supermarkets and local produce. In Wilmslow, and nearby Alderley Edge and Handforth. There are several good department stores in the area including Hoopers, Marks & Spencer and John Lewis. Wilmslow residents have easy access to good supermarkets, there are two in Wilmslow town centre, Waitrose Store and Sainsburys. There is also a Tesco Express which includes Wilmslow's Main Post Office.Alderley Edge has one supermarket, Somerfield. A further two supermarkets, Tesco Store and Sainsburys, can be found just off the A34 road, known locally as the Wilmslow By Pass. Unique Entertainment Guide - Nightlife, Cinemas, Music Venues, Theatres, Pubs and bars. Let us know of any entertainment events you would like to post on our whats on events page and we will place your information on as soon as possible. JOBS IN WILMSLOW, KNUTSFORD, ALDERLEY EDGE - A unique guide to local jobs. Whatsin-Wilmslow has linked up with companies in the area to provide a list with links to participating companies with job vacancies in Wilmslow and Knutsford. If your are a local company that have vacancies to advertise please email: info@whatsin-wilmslow.co.uk. New or regular donors are encouraged to contact 0845 7711 711 or to visit www.blood.co.uk <http://www.blood.co.uk> to make an appointment to donate or for more information. Do you want to do your bit for the environment and join the many thousands who already know the pleasure of recycling no longer wanted items? Then why not join one of the fastest growing non-commercial websites, Wilmslow Freecycle. It was started over one year ago by Oliver Romain and it already has over 3,000 members. Images depicting scenes in and around Wilmslow, Alderley Edge and Prestbury will be displayed as a picture gallery and added to as the collection grows. The above image was taken was taken along Alderley Road ,Wilmslow, looking towards the junction with Water Lane. HandyVan is a new, free service for the elderly being offered by Help the Aged. Support includes small jobs such as changing light bulbs and fitting curtain rails. The aim is to help older people with the type of work around the house they are finding it difficult to do themselves. Materials must however be supplied by the older person.The sevice excludes electric, plumbing or gas work. Wondering what to do with the kids on their days off school? Take a look at our Family Friendly section in Places of Interest. There you will find lots of ideas for a fun day out. Small well attended retail market serving the local community is held in Bank Square every Friday. The Market currently consists of five stalls with three product categories: namely fish, cheese and fruit and vegetable stalls. In addition there is a flower stall on Grove Street selling flowers six days a week. Now held at the Festival Hall starting Sunday 12th September. There will be 22 stalls selling a range of produce from farm reared meats to home grown fruit and vegetables, home made jams, cakes etc. Like to work for one of the fastest growing and most successful companies in the UK in Knutsford, Cheshire. "How to defend prosecutions involving the use of mobile phones whilst driving."